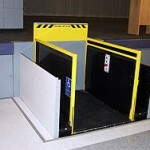 The HAL is considered a �Raising Out Of The Floor Lift�, a vertical platform lift that stores beneath the floor�s surface hidden by hinged floor panels. When the lift is needed, the floor panels open, the lift raises to the surface and it ready for travel up to the upper elevation. 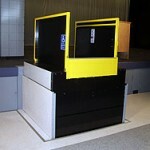 Invisible until needed, the HAL requires a 24-inch deep pit and has a maximum vertical travel of 36 inches. 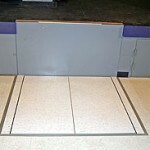 This unit is designed with the same proven technology of the AccesStair and Accessor wheelchair lifts. 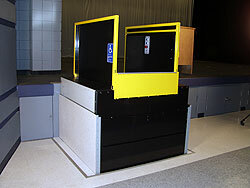 The Hidden Access Lift (HAL) is an ideal solution for providing access in Theaters, Historical buildings and Performing Arts Centers. Anywhere when your project requires a minimal amount of disturbance to the aesthetics and a minimal amount of space is available. 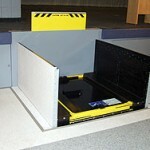 On your next project consider the invisible solution: The Hidden Access Lift! For commercial applications, a variance will be required from the Authority Having Jurisdiction (AHJ). Prior to the start of design or construction, please contact LIFT-U for further assistance.